(TORONTO) – The innovative, bold and efficient Toyota Venza returns for 2012 with a wealth of standard equipment and a world of choice –to help create the Venza that’s right for you. The Venza 4-cylinder FWD may now be ordered with a Premium Package, which adds leather seat surfaces, heated front seats, power rear door with jam protection, back up camera, panoramic glass roof and anti-theft system. The Venza 4-cylinder AWD may now be ordered with a Navigation & JBL Package, which adds a 13-speaker JBL Synthesis Audio System with four-disc CD changer, a DVD-based navigation system with integrated back up camera, XM Real-Time Traffic capability, and more. The 2012 Toyota Venza is smooth and quiet, yet athletic and agile, thanks for a choice of two intelligently advanced engines. A 2.7L four-cylinder delivers up to 182 horsepower, while a 3.5L V6 generates up to 268 horsepower. Both feature lightweight aluminum alloy blocks, dual overhead cams, Dual Variable Valve Timing with intelligence (Dual VVT-i) and Sequential Multiport Electronic Fuel Injection for maximum power and efficiency, and achieve a Tier 2 Bin 5 emissions rating. Pair either engine to Toyota’s proven six-speed automatic super ECT transmission with overdrive, sequential shift mode with gate type shifter, lock up torque converter and transmission cooler. Then choose between fuel-efficient front wheel drive or the added confidence of all-wheel-drive with Toyota’s Active Torque Control System. All Venzas are equipped with a towing prep package for those who want to haul a trailer. Four cylinder models are rated at 1,134 KG (2,500 LB), while V6-equipped Venzas are rated at 1,587 KG (3,500 LB). Control starts with steering, and every Venza features highly responsive, fuel efficient electric power steering. The Venzas finely-tuned suspension delivers confidence and driving exhilaration in equal measure, with a strong, stable platform and independent front and rear suspensions featuring MacPherson gas struts, coil springs and stabilizer bars, plus anti-vibration subframes. All models feature Hill Start Assist Control (HAC), which automatically applies pressure to the brakes when starting on an incline, to help prevent the vehicle from rolling back. AWD models feature Toyota’s Active Torque Control System. This enables Venza to switch seamlessly and automatically from Front Wheel Drive to Four Wheel Drive, based on driving conditions. This boosts stability while improving fuel efficiency. Variable intermittent wipers plus a rear window wiper/washer and windshield wiper de-icer. The Toyota Venza 4-cylinder FWD features 19” aluminum alloy wheels with locks. An available Premium Package – new for 2012 – adds: leather seat surfaces, heated front seats with seat-mounted high/low setting, a power rear door with jam protection, a backup camera, a panoramic glass roof, and an anti-theft system. The Toyota Venza 4-cylinder AWD features 19” aluminum alloy wheels with locks. An available Premium Package adds: leather seat surfaces, heated front seats with seat-mounted high/low setting, a power rear door with jam protection, a backup camera, a panoramic glass roof, and an anti-theft system. An available Touring Package includes all items in the Premium Package, plus: Four-way power adjustable passenger seat, premium leather seat surfaces, the Toyota Smart Key System with Push Button Start, chrome-accented exterior door handles, a front door handle touch sensor to lock/unlock the vehicle, satin mahogany woodgrain-style interior trim, leather wrapped steering wheel and shift knob, stitched leather interior trim, and auto-leveling headlamps. An available Navigation & JBL Package – new for 2012 – adds all items in the Touring Package, plus: a JBL Synthesis audio system with 13 speakers and six-disc CD changer, a DVD-based navigation system with integrated back up camera, and XM Real-Time Traffic capability. The Toyota Venza V6 FWD features 20” aluminum alloy wheels with locks. The Toyota Venza V6 AWD features 20” aluminum alloy wheels with locks. An available Navigation & JBL Package adds all items in the Touring Package, plus: a JBL Synthesis audio system with 13 speakers and six-disc CD changer, a DVD-based navigation system with integrated back up camera, and XM Real-Time Traffic capability. 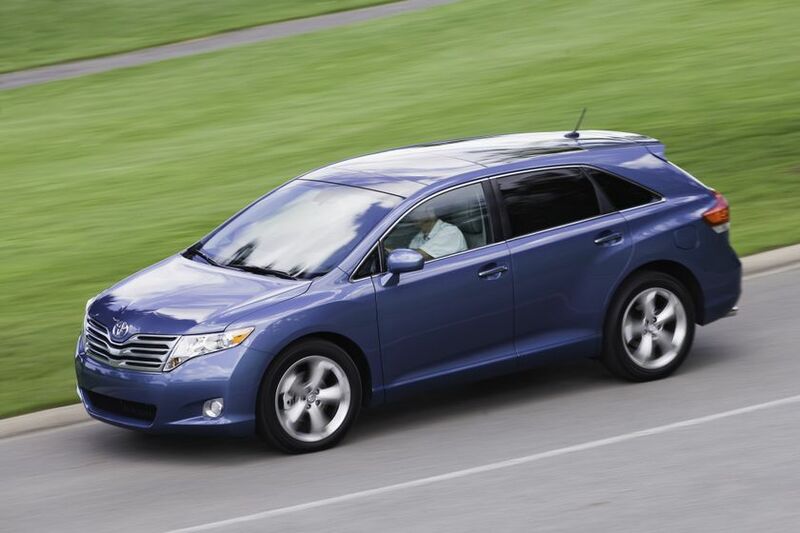 The 2012 Toyota Venza is now on sale at Canadian Toyota Dealers. The Venza 4-cylinder starts at a suggested retail price of $29,425 for the FWD model and $30,875 for the AWD model; the Venza V6 starts at an MSRP of $30,915 for the FWD model and $32,365 for the AWD model.